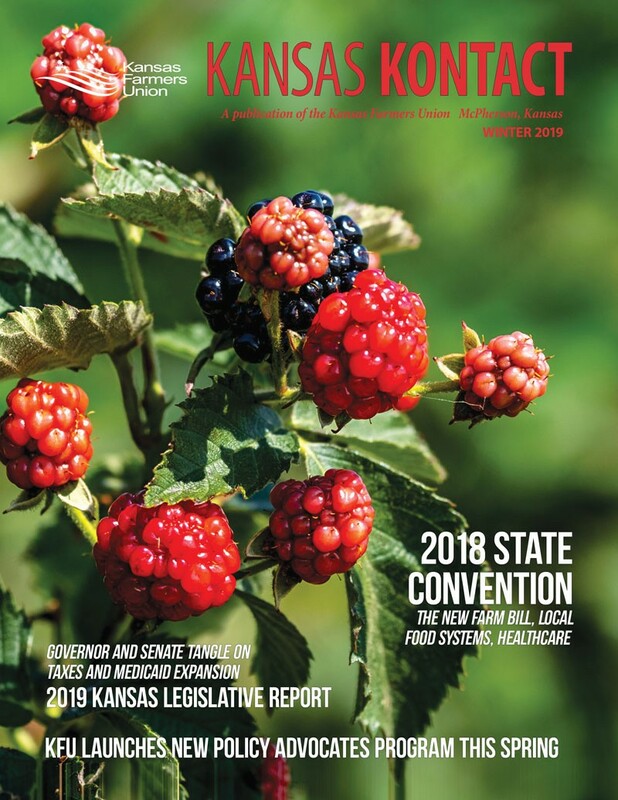 The Kansas Kontact is the official publication of the Kansas Farmers Union and is published quarterly and mailed to members. View the Winter 2019 Kontact on ISSUU. Read the Winter 2019 Kontact articles on this site. Give the Gift of KFU Membership! Clicking on one of the tabs below shows the cover image and top articles for that month. Below the cover image are links to read that month’s articles online or to download a PDF of that issue. View the Winter 2018 Kontact on ISSUU. Read the Winter 2018 Kontact articles on this site. 2018 KFU State Convention scheduled for November 29 and 30 in Mayetta. Industrial Hemp: Is it a miracle crop or another tool in the farmer’s tool box? View the Summer 2018 Kontact on ISSUU. Read the Summer 2018 Kontact articles on this site. Fly-In: Taking Kansas Voices to D.C.
View the Autumn 2018 Kontact on ISSUU. Read the Autumn 2018 Kontact articles on this site. View the Winter 2017 Kontact on ISSUU. Read the Winter 2017 Kontact articles on this site. View the Summer 2017 Kontact on ISSUU. Read the Summer 2017 Kontact articles on this site. View the Autumn 2017 Kontact on ISSUU. Read the Autumn 2017 Kontact articles on this site. View the Winter 2016 Kontact on ISSUU. Read the Winter 2016 Kontact articles on this site. View the Spring 2016 Kontact on ISSUU. Read the Spring 2016 Kontact articles on this site. View the Autumn 2016 Kontact on ISSUU. Read the Autumn 2016 Kontact articles on this site. New Kid in Town: Goat milk and dairy products rising in U.S.
View the January 2015 Kontact on ISSUU. Read the January 2015 Kontact articles on this site. View the Spring 2015 Kontact on ISSUU. Read the Spring 2015 Kontact articles on this site. View the Summer 2015 Kontact on ISSUU. Read the Summer 2015 Kontact articles on this site. View the Autumn 2015 Kontact on ISSUU. Read the Autumn 2015 Kontact articles on this site. Read the February 2014 Kontact articles. Read the April 2014 Kontact articles. Read the August 2014 Kontact articles. Mother Earth News Fair Returns to Kansas: Come and See Us! Read the September 2014 Kontact articles. Read the November 2014 Kontact articles. Read the March 2013 Kontact articles. Read the May 2013 Kontact articles. Read the July 2013 Kontact articles. Read the October 2013 Kontact articles. Read the December 2013 Kontact articles.